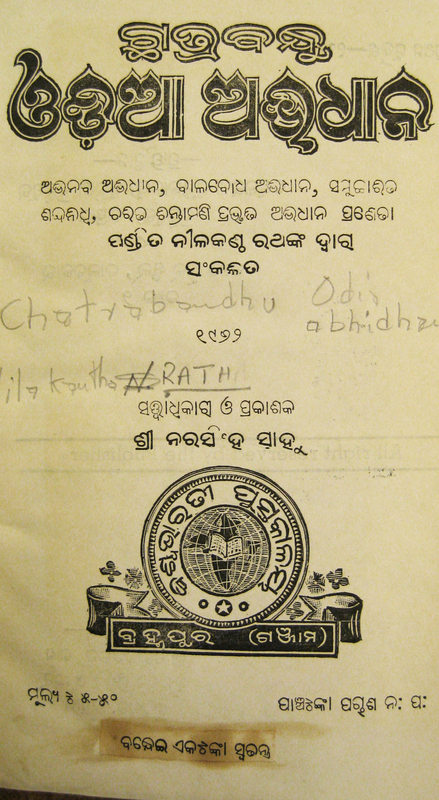 A squat inline and an extravagant, pointed-top, outlined Odiya title on the cover page of Chātrabandhu Oḍiā abhidhāna, written by Nilakantha Rath, 1962. Do you think this is wood type? The India crest on the lower-half of the page definitely appears to be a wood block print. If I ever get a tattoo, that is a leading candidate. The supporting text is set in a monolinear Odiya typeface, with a bold version whose lines become thicker, and whose proportions become wider. I like it quite a bit more than the common Odiya monolinear fonts that I’ve seen in modern books! Very delicate and warm!